Secret Brief came with a rattling run inside the final furlong to claim the Betway Lincoln at Doncaster. Wearing the Godolphin colours, the four-year-old responded to William Buick's urgings to win the first big handicap of the new turf season for trainer Charlie Appleby. Secret Brief (12-1), who had a spell in Dubai during the winter, got the better of a terrific duel with Ryan Moore on Bravo Zolo to prevail by a neck. Battle Of Marathon came out of the pack to claim third place, another half a length away, with Birdman staying on strongly for fourth. "His last run in Dubai was good and we are just getting to know him. "I think he'll improve for a better surface." 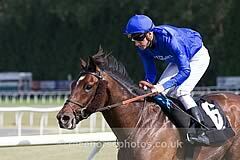 John Ferguson, Godolphin's chief executive and racing manager, said: "It's a lovely start for everybody in the team. "This is a horse that has been trained in Dubai in the winter, so a perfect preparation from the sunshine of Dubai to heavy ground in Doncaster. "He's handled it really well and I was just impressed the way he travelled in the race. "We thought he'd go with a bit of cut in the ground. This was a different proposition but he's genuine and really tries. "He stuck his neck out." Ferguson continued: "He's tough and genuine, which is what you want in this ground. Charlie has done a great job with him. "What we want is our horses to reach their potential, which they haven't been doing, and this is a great start. "We'll have to see what the handicapper does on Tuesday before we make a plan."